Most of us hate the indignities of air travel but for some Americans, Sikhs especially, airport security is humiliating. One Sikh says that it’s not making America safer. While I am excited to celebrate Thanksgiving with my family, I am not excited about the process of getting there. None of us enjoy going through airport security, and this is especially true during the busiest travel week of the year: removing our shoes, removing personal items from our pockets, only to stand in a glass tube and lift up our arms in front of a stranger. All of this is further exacerbated by our eagerness to reach our loved ones as quickly as possible, especially during the holidays. That being said, I think it’s fair to say that my experiences at airport security checkpoints are more humiliating than perhaps most travelers. After passing through the same machines as everyone else, security officials regularly ask me to step aside while they check my turban for explosive residue. This memory pulses through my veins every time I travel now. I carefully scan the eyes of those around me and try to reveal my humanity by smiling at other passengers, particularly the children who do not understand why I am taken aside and who are constantly affected by the social behaviors they see. When they see adults racially profiling and discriminating against specific communities, isn’t it obvious that they would do the same in the classroom? 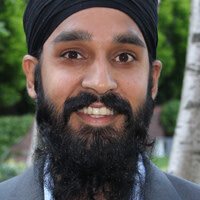 Last year, as I was flying through the San Francisco airport after a conference at Stanford University, security officials violated federal policies by forcing me to let them pat down my turban. It was the most degrading moment of my life. I view my turban as a crown, something that connects me with my religion’s deepest values, such as love, justice, and service. It shook me to the core that our nation, which was founded on the premise of freedom of expression and religion, was supporting and enforcing practices that went against those very principles. I feel committed to these values as an American, and so I responded like any other young American would. I pulled out my iPhone, opened up my FlyRights app, and filed a formal report with the Sikh Coalition and the TSA. The Sikh Coalition took up the case on my behalf, and after a few months of correspondence, I received a formal letter from the TSA apologizing for its mistake. While I appreciate the formal apology, it does not address the real problem. The TSA continues to racially profile airline passengers, and this practice alienates and divides people under the guise of national security. In fact, racial profiling distracts the TSA from identifying more likely potential threats. When a TSA agent takes me aside for further questioning or to get patted down, they are making dangerous and inaccurate assumptions of what a terrorist is or what they look like. These assumptions take us further away from air safety and security. A number of minority communities find themselves between a rock and a hard place. We value the principles of this nation and want to actively protect its values and citizens. However, the discrimination that has been sanctioned and institutionalized by our federal government makes a deep impression on this country’s children, and it teaches them that it’s okay to degrade people on the basis of how they look or what they believe. It’s in the best interest of our nation to take this issue seriously and to develop an approach that simultaneously preserves security and human dignity in this country. I’m waiting for the day when I can finally pass through an airport security checkpoint without being racially profiled. I know it’s coming, and I’m looking forward to it. That will be the day that I finally accept the apology issued by the TSA.